The recently promulgated pact between Russia and Syria to have the former’s Defense Ministry train the Arab Republic’s children in cadet schools for free is a sign that Moscow intends to reshape Syria’s permanent military, intelligence, and diplomatic bureaucracies (“deep state”) in its own image as part of its plan to foster a multi-generational partnership between these two countries, though there might also be a competitive motivation for doing so vis-à-vis Iran. The agreement between Russia and Syria to have the former’s Defense Ministry train the Arab Republic’s children in cadet schools for free just entered into force, and it’s a powerful step in the direction of fostering a multi-generational partnership between these two countries. The guiding concept behind this cooperative venture is for Russia to reshape Syria’s permanent military, intelligence, and diplomatic bureaucracies (“deep state”) in its own image, with it being expected that future graduates of this cadet school will spread throughout these three institutions in their homeland once they return after their studies and therefore serve as an integral bridge forever connecting these two governments, just like what thousands of their predecessors did all across the world during the Soviet period. This is a mutually beneficial arrangement that advances Russia’s interests in lockstep with Syria’s own after Damascus decided to place its future in Moscow’s hands following its request for direct anti-terrorist military assistance against Daesh in 2015. The democratically elected and legitimate Syrian government clearly understood what it was getting into by giving Russia such enormous responsibility, meaning that it must have forecast the long-term strategic implications of this game-changing move which guarantees that Moscow will remain an influential actor in Mideast affairs for years to come. Despite occasional disagreements with one another over the course of the Syrian peace process, albeit never directly articulated and only expressed through separate but contradictory statements about constitutional reform and the situation around Idlib for example, Syria knows that its national interests are best served by siding with Russia over any other power, which explains why it took this dramatic step in the first place. It doesn’t seem to matter to Damascus that its relationship with Moscow is lopsided by the very nature of it representing a small state partnering with a Great Power for protection because this is the objective reality of International Relations and always has been. Recognizing this, there’s always the possibility that Russia will seek to promote its own broader interests in the region in spite of the “opposition” that Syria might have to certain initiatives, and it’s here where the far-reaching implications of the cadet school agreement might become controversial. The reader, and perhaps even Damascus too for that matter, might not have been aware that the prestigious state-funded Russian International Affairs Council (RIAC) released two policy papers this year that spoke about the urgent need for Russia to “reform” Syria’s security services. RIAC is known for the leading role that it plays in determining the Kremlin’s foreign policy, so its proposals should always be taken very seriously and can sometimes be seen as an indication of what Russia will eventually do in any given situation. It’s with this in mind that one should pay very close attention to what the think tank suggested twice this year already. “As a result, a very cautious approach should be implemented, one which will simultaneously initiate restructuring of the security apparatus under public and/or international scrutiny and allow existing structures to provide security. Otherwise, there is a high risk of another escalation. In addition to that, the task of rebuilding trust between Syrian intelligence structures and society is enormous. This is why a political process should be launched to initiate reform of the intelligence services in Syria. This process should help bring positive results on less sensitive issues that are required to precede with more complicated ones. Considering these experts’ consultations and recalling the high level of influence that RIAC exerts in formulating Russian foreign policy, the argument can be made that the country’s granting of free cadet school education to Syrian children is part of its phased strategy for mitigating Iranian influence in the Arab Republic, beginning in the sphere of long-term military education and “deep state” management before eventually expanding into other related sectors. This shouldn’t be surprising to anyone either, as the author previously wrote about how President Putin’s unofficial peace plan for Syria requires Russia to “balance” Iran in the Mideast at the behest of its new “Israeli” protectorate as the most pragmatic way of actualizing its 21st-century grand strategy. While this does indeed seem to be the plan that Moscow is pursuing, the possible point of contention is that Syria might not have realized just how serious Russia is about “balancing” Iran on its territory. Syria has thus far attempted to “balance” between Russia and Iran as it tries to equalize its partnership with the former, but this cunning strategy has increasingly failed to achieve results as the latter comes under ever-intensifying international pressure to curtail and ultimately cease its military activities in the Arab Republic. Although Russia has said time and again, including at the highest level of President Putin himself, that it is not Moscow’s responsibility to remove Iranian forces from Syria, the country nevertheless officially confirmed on three separate occasions this year that it’s indirectly pursuing that very same goal. 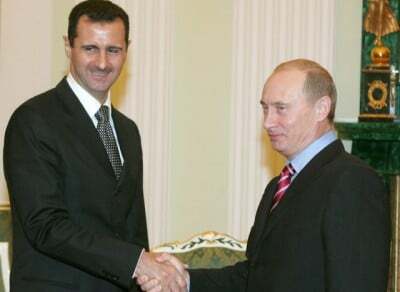 President Putin first said in May during his Sochi Summit with President Assad that “We proceed from the assumption that…foreign armed forces will be withdrawing from the territory of the Syrian Arab Republic”, which his Special Envoy for Syria Alexander Lavrentiev soon thereafter confirmed does in fact “include the Americans, Turks, Hezbollah, and of course, the Iranians”. In case anyone erroneously speculated that Russia’s position on this changed in light of the tragic shooting down of its spy plane over Syria in late September, President Putin reminded the world in early October that “We should pursue a goal that there would be no foreign forces, [the forces] of third states in Syria at all”, thereby putting to rest any such fake news about a possible rethinking of Russia’s stance. The nuance, however, is that Russia won’t actively work to remove Iranian forces from Syria because it currently needs their military forces to continue with their anti-terrorist duties in part of the country so that its own don’t get drawn into “mission creep” doing this instead. Furthermore, Russia has always maintained that it’s ultimately up to Damascus to decide on the fate of these troops, though as can be seen, that doesn’t mean that Moscow won’t “encourage” it to progressively disengage from Tehran. On the surface, there’s nothing political about Russia offering free cadet school education to Syrian children and it seems to correspond with its policy of offering multidimensional aid to the war-torn country, but digging just a little deeper reveals that this is part of Moscow’s strategy for reshaping its counterpart’s “deep state”. Damascus knew what it was getting into by agreeing to this with Moscow, but its decision makers might not have been aware that the highly influential state-funded RIAC think tank produced two reports over the past year proposing that their government urgently begin “reforming” Syria’s security sector, with the most recent one reframing this in a “realpolitik” context vis-à-vis “balancing” Iran. As such, it’s conceivable that Russia intends to gradually advance this goal in the least disruptive way possible irrespective of Syria’s “uncomfortableness” with this since Moscow believes that it’s to the benefit of everyone’s grand strategic interests to see it succeed. This doesn’t mean that the cadet school agreement is a “Trojan Horse” because that would imply that Syria is being “taken advantage of” when it’s not, as Damascus made the sovereign decision based on a calculation of its own long-term self-interests to accept the far-reaching strategic implications of this deal, but it’s just that it might nonetheless not like to progressively “lose control” over its military relations with Iran. To be clear, nothing will probably change right away, but the pattern is still apparent that Russia is slowly but surely working to create the conditions for the removal of Iranian military influence from Syria in line with its three previously cited official statements to this effect. Russia respects the anti-terrorist military sacrifices that Iran has made in Syria and appreciates the political role that it plays in the Astana Peace Process, but Moscow is finally making moves to “gently” curtail the former in favor of facilitating the latter. This article was originally published on Eurasia Future. Andrew Korybko is an American Moscow-based political analyst specializing in the relationship between the US strategy in Afro-Eurasia, China’s One Belt One Road global vision of New Silk Road connectivity, and Hybrid Warfare. He is a frequent contributor to Global Research. Andrew Korybko est le commentateur politique étasunien qui travaille actuellement pour l’agence Sputnik. Il est en troisième cycle de l’Université MGIMO et auteur de la monographie Guerres hybrides: l’approche adaptative indirecte pour un changement de régime(2015).